Staging and grading cancer allows the medical professional to understand the different types, locations and severity of bladder cancer. The “TNM” bladder staging system provides a framework and categorization for a disease (bladder cancer) that requires different strategies of treatment depending on its current state of progress by the way malignant cells look under a microscope. Staging describes the site of the cancer and whether it has spread (metastasized) to the surrounding tissues, organs or beyond. With this information, the doctor is in a good position to decide on the best treatment for the patient and the best possible outcome. Bladder cancer staging is made after the examination of a biopsy removed through the urethra (a procedure called Trans-Urethral Resection of Bladder Tumor or TURBT). In addition to this, the patient is examined further to find out if the cancer has metastasized. (T) Tumor: what is the site of the primary tumor and how big is it? (N) Node: which and how many lymph nodes are affected (if any)? (M) Metastasis: to which parts of the body has the cancer spread to (if any) and to what extent? Occurs during the beginning of cancer, affecting the surface of the bladder’s inner lining. The underlying connective tissues and the muscles are not affected. This stage of bladder cancer is referred to as non-invasive papillary urothelial carcinoma. On the TNM staging system it is Ta, N0, M0. Medically, this stage of bladder cancer is called flat/carcinoma in situ. The cancer is localized in the inner lining of the bladder without affecting bladder muscles, tissues or its hollow part. On the TNM staging system it is Tis, N0, M0. The bladder cancer has gone beyond the bladder lining into the lamina propria mucosae. The muscles of the bladder wall, lymph nodes or surrounding organs are not affected. The corresponding TNM staging system is T1, N0, M0. The bladder cancer has invaded the bladder wall’s thick muscles. This stage is also known as invasive cancer or muscle invasive cancer. The tumor however has not spread to the surrounding fat, lymph nodes or organs. TNM staging system is T2, N0, M0. The tumor metastases have reached the pelvic or abdominal wall without invading the lymph nodes or other organs. This is T4b, N0, M0. The bladder cancer may or may not have metastasized to the lymph nodes but metastases have already reached various other organs. This is T, any N, M1. 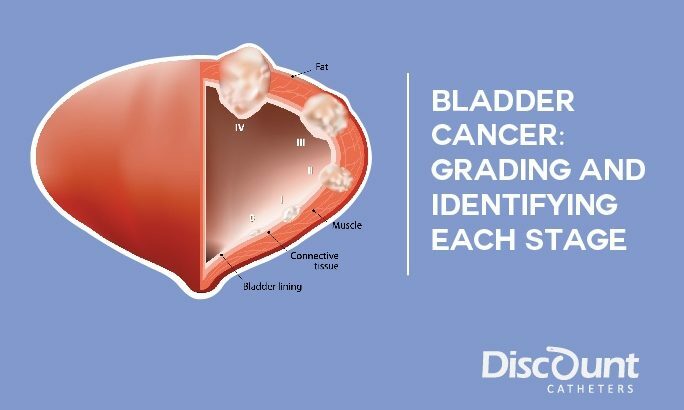 The staging and grading method helps to categorize and define the different types of bladder cancers that manifest themselves in different stages. Armed with this ability to identify different cancers, physicians are better prepared to plan treatment and can attack the condition much more stealthily and adequately.